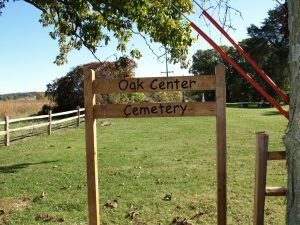 The Oak Center Cemetery is owned and maintained by the Town. It is located on Breakneck Road near the junction with Oak Center Road. 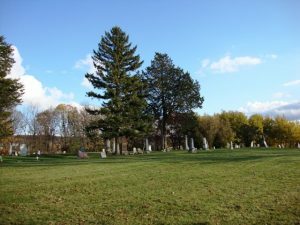 The cemetery is located off the road on a hilly knoll overlooking the Horicon Marsh to the west and the Oakfield "Ledge" to the east. The cemetery was deeded in 1858 with an addition in 1915. Andrew Howard, the only Revolutionary War Veteran buried in Fond du Lac County is buried in the Oak Center Cemetery A large plaque marks the site and was rededicated in 2011 at a ceremony conducted by the Wisconsin Society of the Sons of the American Revolution. Cemetery plots can be purchased at a cost of $500 for a double from the Cemetery Supervisor. Three other cemeteries are also located in the Town: Avoca Cemetery on County D east of Oakfield, Mt. Pleasant Cemetery on Kinwood Road, and Rock River Cemetery on US Highway 151.